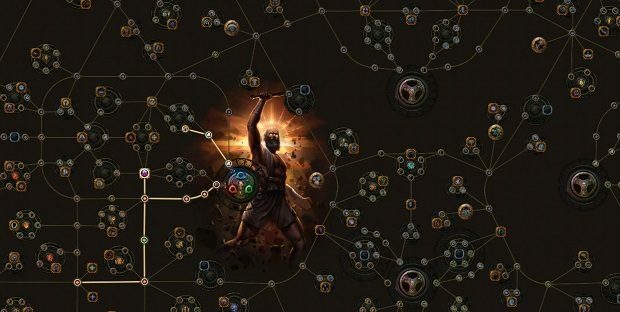 A massive skill web is symbol for Path of Exile. As Grinding Gear Games proudly proclaim on their website, it has a whopping 1350 skills. The possibilities are nearly limitless, although I predict that the community will eventually fall in line with certain passive skill allocations that are "best-of-class" (or what are commonly known as cookie-cutter builds). It will be possible to re-spec your choices to a limited extent, but if you want try a radically different build, you will probably have to roll (create) a new character. All classes use the same tree, but start in different places. When a character levels up or completes certain quests, he or she gains one skill point. A skill point allows the player to allocate a node on the skill tree, provided that it is already connected to an allocated node. This is how the character's passive 'path' is formed. Starting Areas: Your character starts with points in a certain area, but you can also feel free to work towards other classes' nodes. Paths: Much of the skill three consists of paths that offer a +10 bonus to one of the three core stats. Try to pick up the stat you need as you work towards other features on the tree. Clusters: Groups of similarly themed nodes, often with an icon in the center of them. Clusters come in many sizes and often have a gold-colored skill that is especially powerful and desirable. Keystones: Unique nodes that change the balance of game mechanics for your character. Each one has an amazing buff but also a significant penalty to consider. Each time you level up or complete certain quests, you can allocate a skill and explore deeper into the tree. Your characters can accrue passive skill points from levels and quests, depending on the choices a player makes in the quest Deal with the Bandits and 24 skill refund points. If you want to adjust your passive build during gameplay, there are Passive Skill Refund points available from quests or relatively rare items in the game that can be found or traded for.